Successfully taking down a deer or elk with a bow requires patience and a whole lot of practice. You need to know your arrow will fly straight and true when an opportunity finally presents itself. In fact, practice is essential no matter whether you’re hunting with a bow or a gun to give yourself the best possible chance for a clean, ethical kill. Many archers get their start shooting at hay bales, but in truth, they really aren’t the best archery target due to the fact that the arrows tend to get buried deep enough to damage the fletching. While hay bales will definitely work in a pinch, you’d be much better off purchasing a quality archery target designed specifically for the purpose. Nowadays you can find a huge range of archery targets. There are 3D targets that look just like a big buck, coyote or other game to more basic block and bag targets. Each type of target is designed for specific purposes, so it’s important to choose the right target for each situation. This will prevent damage to both your arrows and the target itself. As it seems that some bow hunters are still unsure about which targets they should be using when, we’ve produced this handy guide to help you in your search for the best archery target . The guide also contains archery target reviews to allow you to compare the top models. Keep reading for more details on each of these targets. But first lets take a look at the different types and what each kind of target is best suited for. Each type is designed for a specific shooting set up. For this reason, no one type is that much better than any of the others, as they all have their uses. The most versatile of the three types, foam block targets are generally quite lightweight and more portable than the others. This makes them the ideal choice for outdoor target practice , as they can easily be carried out to the range and positioned wherever you need. Most foam block targets are also more weather resistant than other targets. The foam is less likely to soak up water compared to the more porous materials used in bag targets. Although they are available in a range of different styles, most block targets use layers of foam stacked tightly together. When the arrow hits the target, the tip generally slides in between the layers of foam, where it is quickly stopped due to friction. As these targets use friction instead of force to stop the arrow’s momentum, they are much less likely to cause damage to the arrows. In addition, the arrows are generally quite easy to remove from in between the layers of foam. However, it should be noted that these targets are usually only designed for lighter bows. If you have a bow with a heavier draw weight, it may cause the arrows to be buried quite deeply and thus be much harder to remove from the target. Still, it’s important to pay attention when setting up your block target. The target should always be set up so that the foam layers run horizontally and never vertically. This ensures that your arrows slide in between and are pinched by the layers, instead of hitting across the layers, which could damage your arrows. Most foam block targets can be used with broadheads , although they may cause a bit more damage to the target and shorten its life. On the other hand, if you only shoot at it with field points, any good block target should be able to last for years. You can also find a range of tougher foam block targets designed specifically for use with broadheads. Whereas bag targets and 3D practice targets can only offer a smaller number of points for you to aim at, the majority of foam block targets are either four-sided or six-sided. This provides you with a wide range of different targets to shoot at, including larger targets designed for improving your aim and smaller targets so you can work on pinpoint accuracy and perfect shot placement. The most basic type of archery target, bag targets are an ideal choice for beginners. They are also the type of target most recommended for indoor practice . This is mostly to do with the fact that the synthetic fiber fill used in most bag targets is quite porous and not very weather resistant. Many larger bag targets also tend to be quite heavy and more difficult to move around. This is another reason why they’re more commonly used for indoor archery ranges. The synthetic fill used in bag targets offers plenty of stopping power, making them suitable for virtually any compound bow setup – even bows with a heavier draw weight. However, it is important that you only ever use field points with a bag target, as a broadhead will generally become stuck and end up ripping or tearing the bag when you attempt to remove them. Still, as long as you use field points, the arrows should be quite easy to remove and the target should easily be able to withstand hundreds or thousands of shots. Most bag targets are quite large and provide much more surface area to shoot at than other types of targets. This makes them a great choice for beginners, as the large size makes them much more forgiving and easier to hit. Although foam block and bag targets work well for general target practice, when it comes time to hone your skills for hunting a three-dimensional practice target is definitely your best bet. 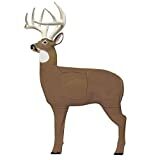 These targets are made from molded foam and are designed to look exactly like an animal to allow you to more accurately prepare for real life hunting situations. Whether you’re planning on hunting deer, turkeys, hogs or any other type of game, you can definitely find a 3D target that’s the exact shape and size of the animal you’re after. In fact, there are a variety of 3D targets designed to resemble virtually every type of animal you can imagine—even extinct ones like a T-Rex and other dinosaurs . Many 3D practice targets also have special overlays that show you exactly where the vital organs are, which allows you to practice placing your shots in the exact spot required for a clean, ethical kill. Most 3D targets are also fairly easy to transport, which allows you to more accurately mimic real hunting situations, such as shooting at the target from your tree-stand . Unfortunately, like the other targets, these 3D practice targets generally work better with field points, as broadheads are more likely to get lost within the foam core. The foam core itself also causes a few other minor issues. For example it tends to wear out quicker than other types of targets. Luckily, many models feature replaceable sections to help extend the life of the target. This allows you to save money by only replacing the damaged section instead of having to buy a whole new target. If you’re looking for a versatile archery target designed to withstand heavier bows and broadheads, this is a fantastic choice. In fact, it’s generally considered the best archery target for broadheads due to its solid foam construction, which is able to handle the impact from broadheads much better than most layered foam block targets. Like most other Rinehart targets, this one uses its special ‘self-healing’ foam. This foam helps to extend the life of the target. 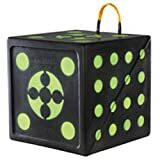 The target features six sides for you to shoot at—two of which feature 12 smaller targets to practice arrow placement and four that feature larger targets to practice holding your aim. Although it is definitely a bit more expensive than other block targets, the fact that it’s one of the toughest targets around makes it well worth the price. Designed specifically for bows with a heavier draw weight, this layered foam block target can easily handle shots of up to 400 fps. This target features four shooting sides, each one with its own unique targets. One side provides six bulls-eyes for you to aim at, while another features a full color image of a deer’s mid-section with the vital organs highlighted red. As well, this target allows you to play games with your friends. One side features a dart board and another features a 9-ball game. Although it only works with field tips, many experts consider this to be the best foam block target currently available. Another outstanding Rinehart target, the 18-1 Broadhead Target is definitely one of the most unique targets on the market, as its shape provides you with 18 different aiming points. A convenient carrying handle makes it easy to transport, and also allows you to hang it from a tree. Like other Rinehart targets, the self-healing foam ensures that it can handle repeated hits without fail. Rinehart also guarantees that this target will last for at least a year or more. 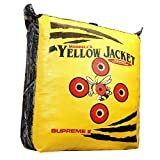 Hands-down the best bag target on the market, the Morrell Yellow Jacket target provides many benefits not found in most other bag targets. For starters, at only 23 pounds, it is much easier to transport than most others. As well, the target uses a special internal frame system that helps to extend the life of the target and also ensures that its stopping power extends all the way to the outer edges. This means you won’t have to worry about damaging your arrows even if you don’t hit the target in the dead center. Another reason it is so popular is that it’s one of the only bag targets to be truly waterproof, ensuring you can leave it outside without having to worry about it being ruined by rain. This target is also quite affordable, meaning it might just be the best archery target for the money. While there are a range of different 3D targets on the market, the Glendel Field Logic range is generally considered to be the best. This realistic looking buck target features a large, removable core, which can be replaced whenever it starts to wear out. The core shows exactly where the vitals are, allowing you to practice your shot placement. It is also quite lightweight and has a handy rod that can be stuck into the ground to allow you to set it up wherever you need. Still, the reason these Field Logic 3D targets are so popular is the type of foam they use, which both lasts longer and offers more stopping power than most other targets. Many serious bow hunters end up owning a variety of different targets, which gives them the flexibility to use the appropriate target for various bows and shooting situations. Still, if you’re limited to only one target, a sturdy foam block target is generally your best choice. They are versatile enough to be used with virtually any bow setup and arrows (including broadheads). Nonetheless, it’s always important to choose the correct target for your specific purposes. If you’re just looking to practice your aiming and improve your accuracy, almost any block or bag target will probably work. On the other hand, if you’re shooting with a heavier compound bow or a crossbow, you’ll definitely want to purchase a heavy-duty foam block target that can easily stop these faster arrows without damaging them (or the target). On the other hand, if you’re looking to make sure that you’re fully prepared for the upcoming hunting season, then a 3D practice target might be the better choice. Although many expert bow hunters also use this type of target, a 3D target can be especially handy for new bow hunters as they allow you to get used to shooting at the animal’s silhouette. They’re also useful for ensuring that you can place your shots precisely in the kill zone to avoid accidentally wounding the animal instead of getting a direct, clean kill shot. As you can probably see from the reviews above, there are actually a wide range of different models that could be considered to be the best archery target, as it all depends on how you plan on using it. Nonetheless, any of the targets that made our list are excellent choices that will allow you to perfect your skills to give you the best possible chance of success this next hunting season.